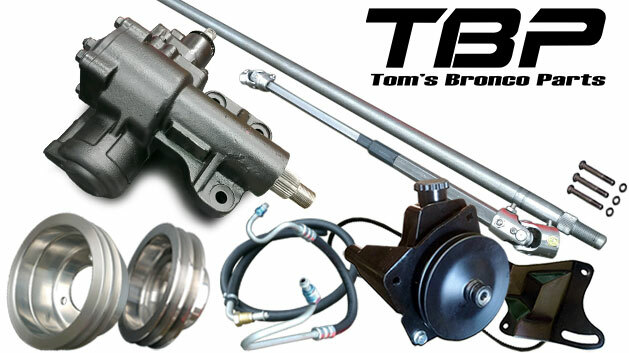 Complete Power Steering Conversion Kit for 66-77 Ford Broncos. This power steering kit includes all you need to upgrade your manual steering to power steering. This is the best completely bolt-on Power Steering Kit on the market! This complete power steering conversion kit comes with steering shafts, close ratio power steering gearbox, power steering hose kit, power steering belt, heavy duty saginaw style power steering pump kit w/mounting bracket and pulley, power steering pump tension bracket, double groove crankshaft & water pump pulleys & all mounting hardware. This power steering box uses the factory holes in the frame so no drilling is needed. Utilizes the stock pitman arm so factory steering geometry is kept. Close ratio. PLEASE NOTE: Please select your engine and whether you have a body lift or not. Please call if you are not sure of the difference between a body lift and a suspension lift. When using a new upper steering shaft in a 66-73 Bronco, we suggest you purchase our #3695 Bearing Sleeve for assembly. Fits 66-77 Ford Broncos. This power steering kit is designed to replace your factory manual steering assembly. Includes all parts needed for a bolt in assembly. This power steering kit will require removal of the steering wheel for installation of the upper steering shaft. I had manual steering in my 66 and boy this is a nice upgrade. Everything went together nice and I don't have the play in the wheel I used to. I was concerned with the 3:1 ratio being too quick but it really handles nice. I installed this on my '71, I will share I had to make some modifications because the pump pulley was pressed against one of the hose connectionsos on the steering box. I put shims between the new motor mounts and engine to gain some gap. Otherwise the set up was easy to install and worked perfectly.